nephrite leaves, gold stalk, rock crystal pot. Peter Carl Fabergé is known the world over for producing elaborate jeweled fantasy eggs for the Russian royal family in the late nineteenth and early twentieth centuries. The artisans of his firm made use of a wide variety of exotic and precious materials in the execution of their commissions and later in items made available to the general public. Among the most exotic and sought after were objects made with an opaque bright red stone-like material known as ‘purpurine’. This was a glass based concoction whose composition was kept a tightly guarded secret. In fact, it was so tightly guarded that the formula was subsequently lost. Purpurine was typically cast into blocks which were then sawed and carved using traditional lapidary and gem carving techniques. The final appearance was of an unknown exotic mineral. The origin story of purpurine begins much earlier than Fabregé, in fact, not hundreds but thousands of years earlier. 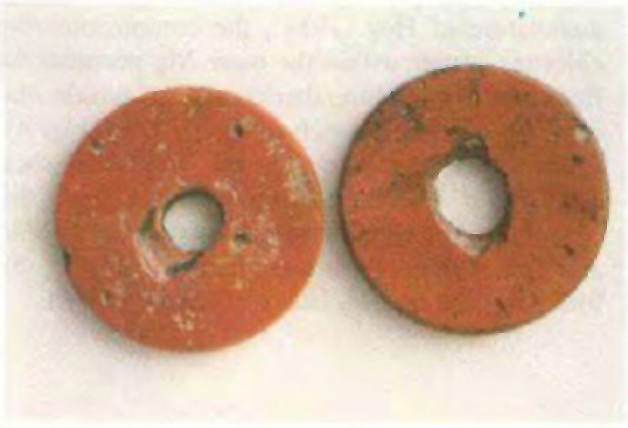 “The art of making this type of glass seems to have originated in India; glass beads of a similar material have been found in the Indus Valley and were dated to the late 2nd millennium BCE.”  In southern Sri Lanka deep red opaque glass beads have been found dating to the first millennium BCE; these turn out to be closely related to purpurine, through a long glassmaking tradition. 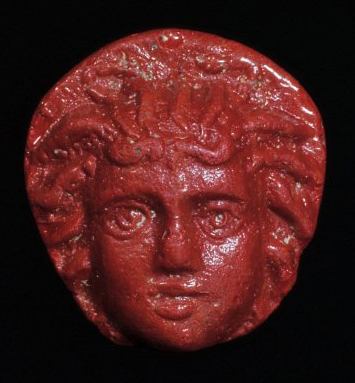 A version of the bright red glass was made in the Egyptian- Roman era. 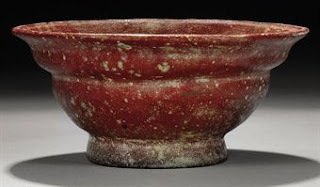 The first century CE historian Pliny the Elder noted that in Greek it was called ‘haematinon’ or blood-red ware. He implied that this specialty glass, was routinely produced in Rome and indeed archaeologists have recovered numerous examples. The glass was used in a wide range of applications from dinner plates to pieces of elaborate mosaics. Eventually, though, the method of making haematinon was forgotten and remained so for several hundred years. opaque red glass c.1st. cent. CE. The Renaissance era had been marked by a strong motivation to recover lost knowledge of the ancient world, but many challenges were beyond the technology of the time. However, attempts were made that eventually led to success. In the second half of the 16th century, Pope Gregory XIII instituted the Vatican mosaic studio to decorate the new Saint Peter’s Basilica, begun by Pope Julius II in 1506. As an aside, this workshop continues today, repairing and conserving the ceilings of St. Peter’s. Having quickly exhausted local talent in Rome, Gregory brought in Venetian masters to teach the art. With the mandate to make the mosaics appear as if painted, the studio developed many new formulations for the glass tesserae – the individual tiles used to form mosaics. It was in this environment that the deep red purpurine [Ital: porporino] was eventually rediscovered. It is still an open question whether the secret was discovered in Rome or brought there. 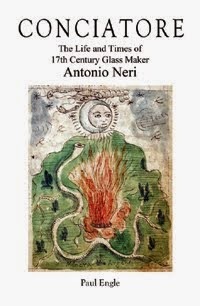 There is evidence that the fabled red glass was being produced in Venice in the eighteenth century and possibly earlier. One (Swedish) source credits Vatican studio employee Alessio Matteoli, in the 1700s, when he oversaw the development of many new colors. In the early 1800s, interest rekindled in the ancient material and by then, analytical methods were up to the task of finding their composition. German chemist, Martin Heinrich Klaproth, analyzed haematinon from the Villa Jovis, a first century palace built by Roman emperor Tiberius on the island of Capri in southern Italy. He correctly found copper, but incorrectly assumed the material was glassy slag, a byproduct of the smelting process. Later, in 1844, Schubarth did further work indicating haematinon was, in fact, a true glass. King Ludwig I of Bavaria intended to build a reconstruction of a Pompeian villa for educational purposes. He assigned Max Joseph von Pettenkofer to the task of rediscovering the method of manufacturing the antique “blood glass,” and the young chemist reported success in 1853. His process fused standard alkali-lead glass with copper oxide and magnetite in the presence of small amounts of magnesium oxide and carbon, followed by very slow cooling of the resultant mass, which would then take on a deep red color. 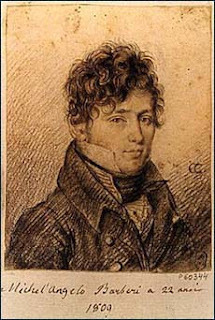 Other sources name one of two students of the famous Roman mosaicist Michelangelo Barberi (1787–1867). Barberi had a long standing relationship with the Russian royal family and accepted Russian pupils at his studio in Rome, he even set up a mosaic shop in St. Petersburg at the request of Tsar Nicholas I. In 1846, these two pupils of Barberi, brothers Giustiniano and Leopold Bonafede were called to St. Petersburg by the tsar to work for the royal court. Giustiniano (1825-66) had served as head chemist at the Vatican studio and both would attain that post for the tsar at the Russian Imperial Glassworks. It is Leopold (1833-78) who is now most often credited with the invention of purpurine as a recreation of the fabled haematinon. His formulation was based on a standard potash lead crystal. In 1882, after considerable training and apprentice work, which began when he was a teenager, a 46-year-old Peter Carl Fabergé fully assumed control of his father’s small jewelry shop in St. Petersburg. Within a short time, he was supplying the royal family with his exquisite eggs and many other items made by a growing assemblage of master craftsmen. The first use of purpurine by the Fabergé shop occurs early in Carl’s tenure, perhaps as early as 1880. Initially, they use material supplied by Petuchov at the Imperial Glassworks. 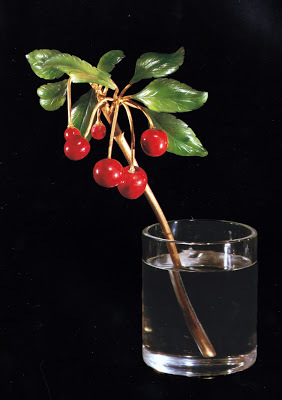 Over a period of years, though, the Fabergé shop developed its own recipe based on soda lead glass, more similar in composition to the ancient samples of haematinon. Other isolated examples of purpurine are known to exist made by competitive jewelers of the time, but no documented recipe has been found. Apparently, Petuchov took the Imperial Glassworks formula for purpurine to his grave. As fame grew for Fabergé, their version is the one that became familiar to a growing clientele in Great Britain and in the United States. When the February Revolution of 1917 brought an end to the Romanov dynasty in Russia, Carl Fabergé fled the country, his company disbanded. In the west, the Fabergé name only multiplied in prestige among the elite and wealthy and items made with purpurine continue to command stratospheric prices. Significant analytical work has been done on the ancient haematinon as well as purpurines of the Imperial Glassworks and of Fabergé. [3,5] The technical differences could easily be the subject of a separate treatment; suffice it to say that knowing the composition of a glass is not the same as knowing the recipe. (Just as knowing the composition of a cake does not mean that one can bake it.) The exact method for making the glass must have involved a long period in which snowflake-like crystals of cuprous oxide (Cu2O) would be encouraged to form, grow and spread throughout the glass forming a tightly interlocking network in the glass. One interesting point is that unlike many other opaque glasses, the ingredients of purpurine do not include a discrete opacifier; it is a clear glass base, which is so loaded with deep red cuprous oxide crystals that light does not pass through even small or thin pieces of the material. Another point is that this glass was not suitable for blowing on a blowpipe and therefore did not take forms typically expected for glass. Perhaps because of this, it has been largely overlooked. The history of purpurine is a reminder of the fragility of human knowledge; it was discovered in ancient times, lost, rediscovered and lost again in modern times. Natural History, xxxvi, LXVII, 198. RR Harding, S Hornytzkyj, A. R. Date. “The composition of an opaque red glass used by Fabergé”in the Journal of Gemmology, 1989. No.5, pp. 275-287. Catalogue Special de la Section Russe a l'Exposition Universelle de Paris en 1867, p. 44, Classe 16, no.111. Op cit. RR Harding, S Hornytzkyj, A. R. Date, 1989. 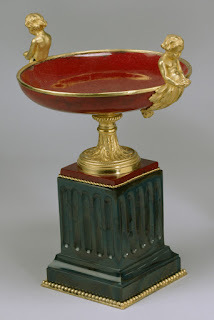 For more on competitive jeweler’s purpurine, see: Géza von Hapsburg: “Some of Fabergé’s Other Russian Competitors” in Fabergé, Imperial Craftsman and His World, London: Booth-Clibborn, 2000, pp. 323-325.